They’re in order as woven, left to right. #3 is already spoken for; the other two will be subject to a friend’s scrutiny and choice, and the last one will either go to Raven Rocks Gallery, or to my showroom display here in the studio. All three go home with me today, and will be vigorously washed and spun, then hung on my old wooden drying rack to mostly dry. I’ll bring them back to the studio on Monday for final detailing — ironing, trimming, pricing and tagging. 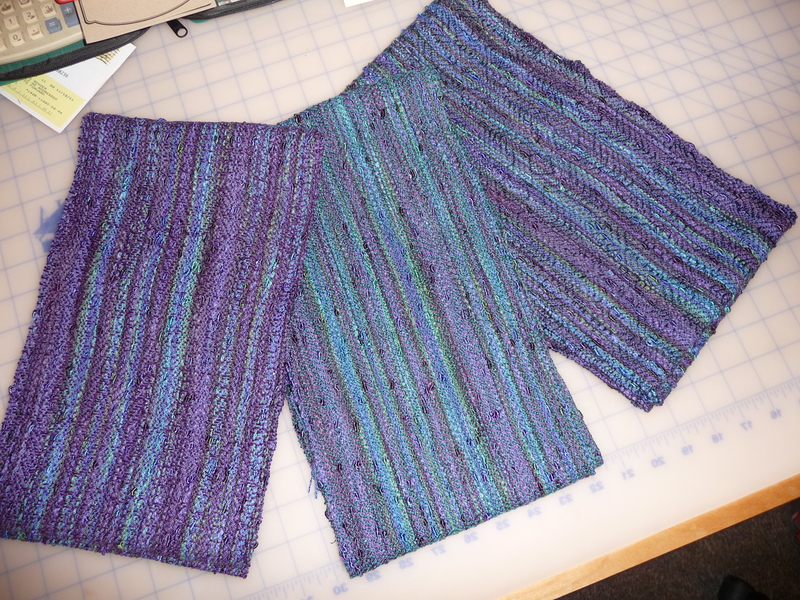 What doesn’t show up well in this shot is the fabulous texture, created by nifty lumps of very shiny rayon randomly distributed throughout the warp yarn; the bumps pop off the surface of the cloth all over the place, catching and reflecting the light. Magical! I’m off home to do a minimalist Christmas celebration with my dear husband. A happy and enjoyable day to all.